Our guests continue to be amazed with the plethora of activities that our area offers. Many of our guests book an upcoming visit at check out because they can hardly wait to return to experience more of Nelson County. There is LITERALLY something for everyone here, so we have created a few sample categories to guide your perfect getaway plans. Alcohol Heaven. We are surrounded by 30 top-notch wineries, 4 amazing breweries, an award-winning distillery, and an over-the-top cidery. Schedule an afternoon on our Wine Tour van, and you’ll get to experience the best of them. Mike drives our guests to a plethora of stops, serves you all a professionally packed picnic lunch from one of our favorite local restaurants, and delivers you home just in time for a pre-dinner nap. Virginia wines are getting a lot of attention, and we are nestled right in the heart of all the action! Hiker’s Paradise. We have a multitude of hiking options within a short drive of the Orchard House Bed & Breakfast. Crabtree Falls is popular with hikers from all over the country….a mere 30 minute drive from us, it’s a 1.7 mile hike UP and the same 1.7 miles DOWN. Or you can walk a mere 400 feet, “check in” on Facebook, snap a few fabulous photos, and head to Devil’s Backbone Brewery for lunch. Regardless of your hiking skills, the Crabtree Falls experience is spectacular. 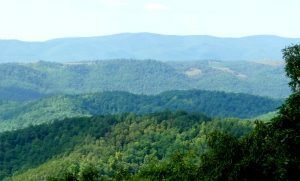 There are so many different hiking options here that we have an entire rack card on “Nelson County Hiking” and we’re happy to recommend the perfect fit for you! History and more History. We are an easy 30 minute drive from Thomas Jefferson’s Monticello, Poplar Forest, Montpolier, Appomatox, even the Walton Family Museum is close by in Schuyler. We have history buffs from all over the world staying here so they can tour the properties, see the statues, and experience the vast Virginia history firsthand. Extreme Bird-watching. We are proud to stock the multitude of birdfeeders all over our property and boy, do the birds love us. We recently had a guest who spent 15 minutes on our front porch and she reported that she spotted over 20 different bird varieties at our feeders. Our resident woodpecker plays nicely with all the birds, as does our “yoga squirrel”. Ultimate Relaxation. So you just want to get away from the grueling big city lifestyle and not do one thing? Perfect, we have that option, too. Sit on our front porch, stare at the Blue Ridge Mountains, lay in the hammocks looking up at the blue skies, choose a spot around our gas firepit and marvel at the stars. Plant yourselves around our salt-water inground pool and breathe in the fresh mountain air. Pour a glass of wine and plop down in one of our many Adirondack chairs, focusing on the pond fountain. Schedule a Couple’s Massage or spa treatment, our spa team is happy to come to you! There are no expectations here, no deadlines, no commutes, and no worries. Foodies Delight! We have several restaurant options…some as close as two minutes away, others an easy 20 minute drive on the other side of the mountain. There is always the downtown Charlottesville mall, with its multitude of amazing restaurants, bars, coffee stops, and boutiques. And downtown Lynchburg with its amazing steak houses, pizza joints, and Mexican fare. There is something fabulous for every food lover, and we are more than happy to help with suggestions when you arrive. No matter what your interests are, we are confident that we have fabulous options here in Nelson County. We can’t wait to help you plan your ultimate getaway, and we love to hear all about your adventures. We love being part of Nelson County, and we know you will, too! We have had the pleasure of staying at Orchard House four (yes, that’s 4) times and we keep finding new things to do while there. We still have activities on this list to complete and look forward to our next visit in May. Book early because this fabulous venue fills up fast!! !